On March 24, 2014, HP announced two new products, the HPOfficejet Enterprise Color MFP X585 and HP Officejet Enterprise Color X555. Powered by HP PageWide technology and following the success of the earlier PageWide-based product, last year’s Officejet Pro X (see “Cheers to HP -Officejet Pro X Series now available, and recognized by Guinness Book of WorldRecords”), big things are expected from these enterprise-grade models, judging by my preview at an HP Industry Analyst event earlier in March. 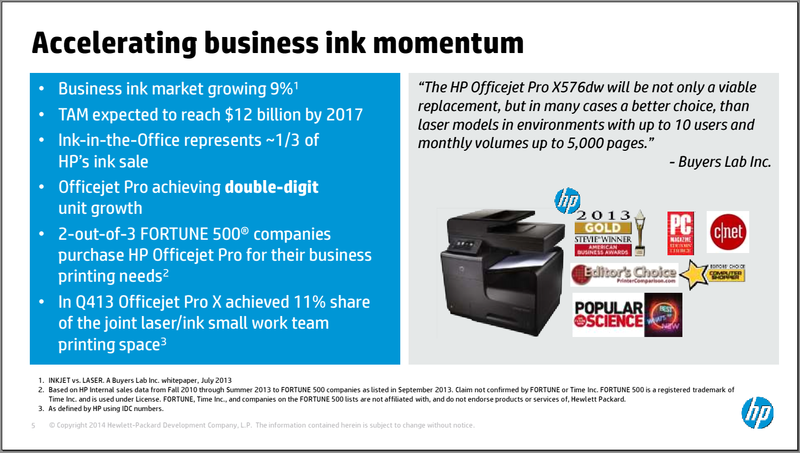 HP has made the Officejet Pro X the current front-and-center flagship of their long-running “ink in the office” initiative, and now with these new products, sees a parallel “ink for the enterprise” effort extending into the worlds of large organizations and managed print services, still with a “half the cost per page of lasers” message. The new products’ capabilities also draw parallels to HP’s enterprise LaserJets, with the press release noting that they include “the same user interface as 12 million HP enterprise LaserJet printers,” and share many of those products’ large and impressive paper handling options as well. As my regular readers know, I don’t normally cover new product announcements as part of Jim Lyons Observations, at least to any great extent, unless they have an underlying, compelling story. So before going on, I should explain the further intrigue here. But back to the product details for a bit. As mentioned, I had the opportunity to see the new products and they are very impressive machines, adding a number of enterprise-grade features to the foundation of HP PageWide technology that is part of the successful Officejet Pro X (see graphic above). 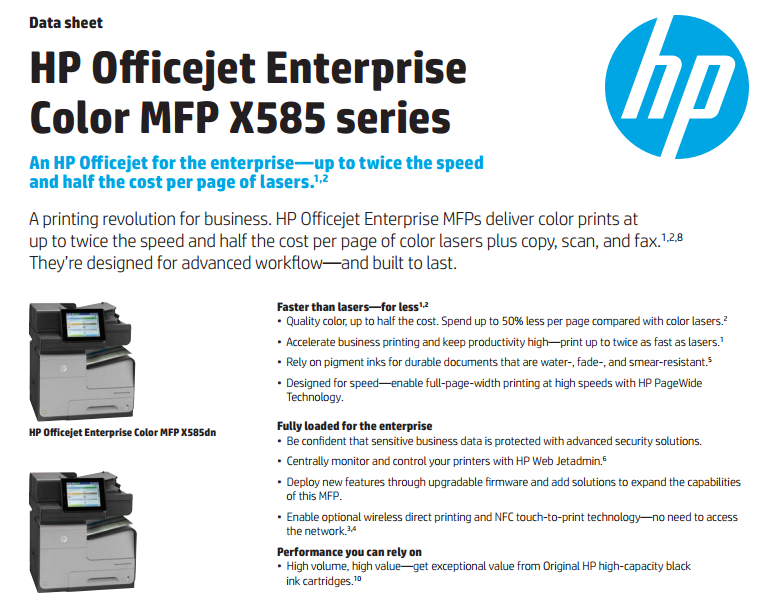 “Printing at twice the speed but half the cost of lasers”, as stated by HP, is the obvious lead, with “exceptional enterprise-grade security, fleet management and mobile printing options” (again, from HP, this one in a quote by PC and Printer chief Dion Weisler), my personal favorite is the aforementioned “spot or accent color mode” pricing feature, “which includes a small logo or line of hyperlink text, at the same price as black-and-white prints.” Of course, this is the cost-per-page pricing familiar in the Managed Print Services world. Much of my enthusiasm comes from how we blogger/analysts, and also including those in the world of marketing and entrepreneurship academia, the other half of my "second career", so frequently point out the importance of innovation. And that is not just product innovation, but also business model innovation. And as much as we talk about it, sometimes we have a difficult time citing creative examples. There are some big ones, and of course in the printing and imaging industry much has been made of the business-model and behavioral shift from companies converting from product-oriented to service-oriented businesses, leading to the establishment of the Managed Print Services business, which now seems to have always been an integral part of the industry. Part of that “click charge” definition, of course, was that customers were paying for two types of pages, black-and-white and color. But in 2007, with Edgeline, HP really got creative and broke that mold, recognizing there was a “third type” of page. By definition, Edgeline and now Officejet Enterprise customers can print a mostly black-and-white image, with a very small amount of color, and are be charged only for a black-and-white page. In the case of HP’s new product, this amounts to a dramatically different 1.1 cents versus 5.5 cents for full-color, highest quality mode, or 4.4 cents for general office color mode. And what customer wouldn’t love it, especially those (all of them) who might want to insert their company logo and/or colored signature block into a traditional black-and-white business letter or form? I had honestly wondered, with Edgeline’s demise, did this business model innovation have to die with it? Not at all, proves HP, with this new feature included as part of this big announcement. My post from nearly five years ago, reflecting on the LaserJet's 25th anniversary (see “December Observations -- 25 years of LaserJet”), was an interview with since-retired HP VP and original LaserJet engineer Von Hansen. There, we reflected on HP’s original laser printer, from 1979, the behemoth 2680. This $100,000 monster was designed to work, exclusively, with HP’s then-successful minicomputers, but that in surprising ways, its development contributed mightily to the LaserJet, printer announced five years later. This was despite the fact that the 2680 itself goes down in the business history books as a commercial flop. So with HP’s new PageWide MFP and printer for the enterprise, full of product innovation and clearly leveraged from its most recent and successful products, there is also an historic debt to Edgeline, particularly with the "spot color" pricing feature, an customer-friendly business model innovation just too good to hold down.